There cannot be many Australian winemakers operating their own winery in the Mosel Valley in Germany. For most estates, it’s a deeply traditional area, where generations of family vineyards have worked these very particular soils. This is the cool, northern fronteir land of winemaking, where only by planting on steep slopes can vines receive enough sun exposure to ripen, the classic slate-strewn hillisides also reflecting an extra degree or two of heat. It’s a treacherous and difficult land on which to grow grapes (some slopes have an incline of over 60 degrees) and of course in terms of the highest quality wines one grape variety, Riesling, is entirely dominant. This is not, therefore, the natural habitat of the Antipodean winemaker. 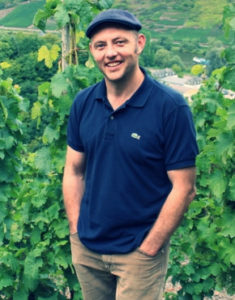 Yet it is in the Terrassenmosel, high in one of the coolest sub-regions of the Mosel, that Martin Cooper has settled as winemaker at the Weingut Kloster Ebernach. Martin arrived at the Franciscan monastery in 2014 as a winemaking consultant, and within six hours was asked if he would like to take on the lease himself on a long-term basis. As a confirmed Riesling lover whose travels have taken him around the world, one of the more unlikely marriages in the winemaking world began. As you will see from this small sample tasting of two wines below, he is cleary not afraid to experiment either, with his ‘orange’ Riesling spending more than 30 days on skins, fermented with natural yeasts and with minimum use of sulphur. The Kloster Erbenach wines are available through Red Squirrel Wines. (2016) More pale gold than truly orange, Australian winemaker Martin Cooper is an admirer of Jura and natural wines, so has made this highly unusual Riesling with natural yeast, 30 days on skins and minimal sulphur. Its aromas are fresh and boldly appley, a hint of straw, a hint of nuttiness, but bright and expressive. In the mouth it is dry and again distinctive, with apple core and citrus pith dryness, but a fine sense of purity and of delicacy as the acidity extends the finish. (2016) A fabulous, just off-dry Riesling, shimmering with zesty, tangy, lip-tingling freshness, the aromas of rosy red apple and delicate floral notes have that touch of beeswax again too, but then burst through on the palate with real tang, like a dawn shower in a cold mountain stream, though there is some nectarine sweetness and hints of fat juiciness too on the mid-palate, in a purely delightful wine.